This summer, let New Look and Simplicity inspire you to try something new. These pattern companies have created fun skirts and shorts for the season. Here is a look at a few of them. 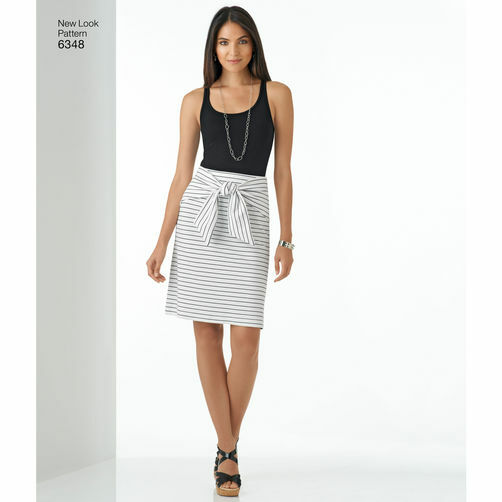 New Look 6129 is a pull-on skirt that’s perfect for casual days. Complete with a drawstring belt, this maxi skirt has an optional slit on the left side seam. If maxi skirts are not your style, you can shorten it to ankle-, knee-, or mid-thigh length. Three of this skirt’s five variations include front pockets: one has cargo pockets and the other two have continental pockets. Cotton and cotton blends, gingham, laundered cottons, calico, silks and silk types, as well as soft, lightweight linen and linen blends are all suggested fabrics for this pattern. New Look 6348, a trendy skirt with interest at the center front, is sure to turn heads. The pattern includes four variations: ankle-length and knee-length (shown at left) styles featuring a front tie; and midi- and mini styles with a front knot and center-front pleat. This pattern is for stretch knits only. Fabrics that are best used for this design include interlock, jacquard, jersey, single knit, and two-way stretch. New Look 6496 is a twist on shorts, and more. The pattern’s skort style can add flair to a simple outfit. 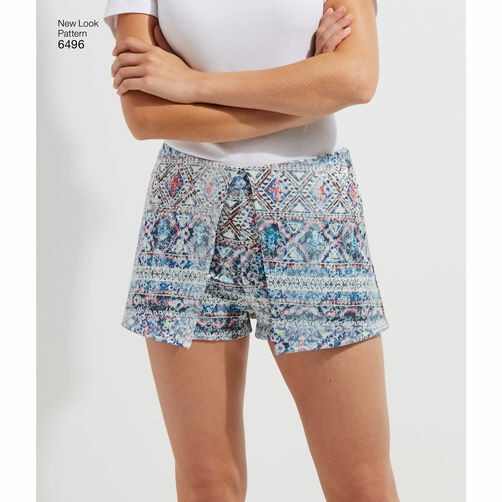 However, the pattern includes separate designs for traditional shorts and a skirt, both of which have a side zipper and darts in front and back. The pattern also has a design for a matching collarless jacket with front patch pockets and bracelet-length sleeves. It can be dressed up or dressed down easily, depending on your fabric choice. New Look suggests the use of brocade, linen types, cotton types, denim, madras, piqué, poplin, sateen, tweed, and twill. Simplicity 1165, a versatile style for summer, is available in three versions: pants, knee length, and mid-thigh length. Every variation includes pockets and an elasticized waist. The ankle-length pants and knee-length shorts have front and back pockets. Soft, lightweight fabrics like batiks, challis, crepe-back satin, double georgette, gauze, gingham, linen types, silky types, and jersey work best for this design. 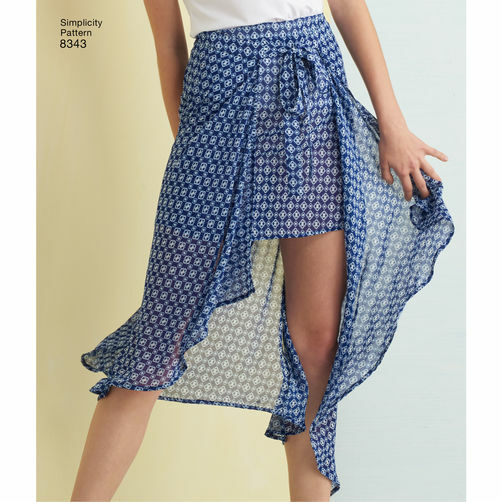 Simplicity 8343 is a wraparound skirt and shorts pattern from the American Sewing Guild. It features your choice of skirt underlay or shorts, and long overlay or short overlay. The front waist ties bring the layers together for a flattering look. Suggested fabrics are batiks, chambray, soft cotton types, crepe de Chine, gingham, lightweight linen types, and silky types. Do you want to make any of these creative designs? If so, which one? If not, are you working on a project right now? Let us know in the comments section below! Amazing looks, the last one is my favourite one! wow, one of the best collection!